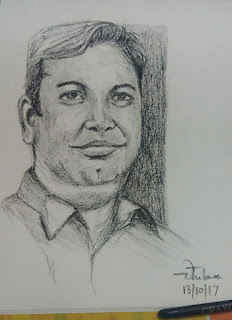 These days, I am learning to do portrait sketching...Actually, I already know how portrait sketching is done but I have simply forgotten the tricks as I am doing it after almost 15 years. So, I am picking up new tricks and styles while I am scribbling my pencils and pens on paper. I have messed up with a lot of faces while have successfully created a few. In fact, the primary motto of going away from Facebook 'again' (shall post the article on 1st Jan'18) was to concentrate on things that make me happy. So, here are my sketches of 2017 in reverse chrono order. Actually, I am not adding all the sketches, the ones I messed up shall not get public :) Shall keep updating this post till 31st Dec'17. Tools: Graphite pencils, Colour pencils, Crayons, Sketch-pens, and Ball-point pens. Few days back, I met an old friend from school days who inquired about the recent book titles that I read. "Sadly I don't get to read much," I said disappointingly showing him the book I am reading- 'Emotional Intelligence by Daniel Goleman'. Another blast from the past from 2013. Did this for younger brother for his English lit assignment in school. 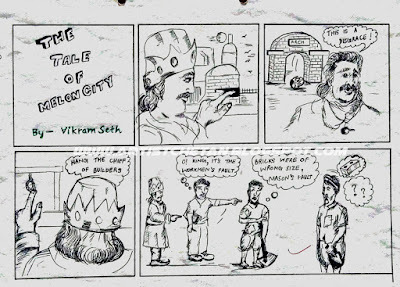 The poem - The Tale of Melon City by Vikram Seth is one of the chapters assigned in CBSE's Class 11th curriculum.